I love this picture, because I was there to witness Amy Jo Hill actually come as close to marking out over a celebrity as I have ever seen her. Amy doesn't usually get too excited over meeting any celebrity, but this was one rare such occasion. I heard about Amy's excitement months before C2E2. I was happy when she committed to going to the event with her fiance, my bud, Chazz Moretti. Of course, Chazz is a pretty big name on the Chicago indy wrestling scene. Amy stated that the only celebrity she really wanted to meet at C2E2 was Austin St. John (which sounds like a wrestling name, ironically). Like any good fiance, Chazz made it happen and I was there to see it all unfold. Amy didn't gush, but she had a controlled giddiness about her. She had her few minutes of special time with the former Power Ranger and ASJ seemed to enjoy meeting AJH. Chazz enjoyed seeing his fiance happy and I enjoyed seeing both of them. 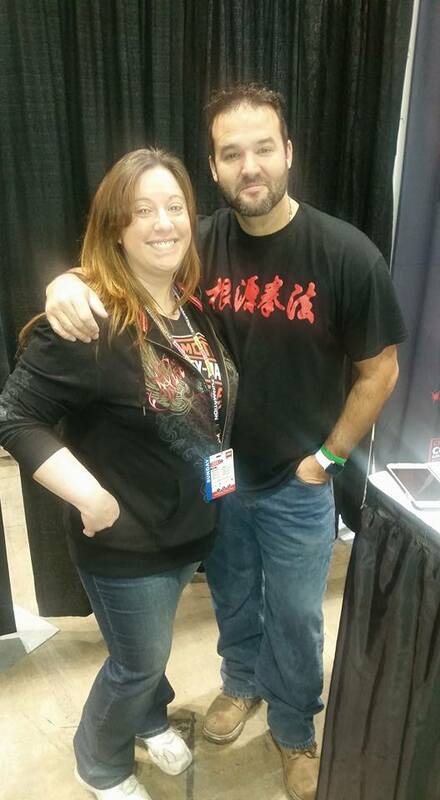 Amy Jo Hill and Austin St. John in Chicago, IL-March 2016.